Note: The above reference to “son” includes both male and female. CONTINUE READING: God Disciplines His Children. 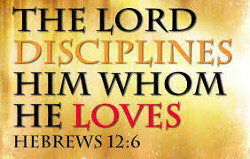 Indeed God's discipline is his deep love for us. I believe this very much. He wants the best for us and will direct our steps to having a happy life with peace, happiness and prosperity. Thank you Bill and Teddy for sharing this awesome post in the SE community.